While this bear market has unique hallmarks, there is something rather familiar about it. We’ve already covered many of the uncanny similarities between the last cyclical bull market and today’s market action. For example, they both bottomed in March and the two charts look like they were separated at birth. The there’s the ensuing flag formation which played out in the same familiar way this year, as it had 6 years ago. And finally, there is the extreme breadth thrusts which are showing an intense, broad based rally pushing the stock market higher. Maybe I’m seeing a pattern where there isn’t one but these similarities are too numerous and too picture perfect to simply dismiss. If you disagree, by all means let me know where I’m going off the right path. If you look carefully, you can see that the bear market ended, at least according to this breadth metric, in July 2002. We then had a beautiful ABC pattern. This is Elliott Wave parlance for a three part wave pattern where the first part (A) takes us against the prevailing trend, then we have a corrective wave (B) and then a final move to complete the countertrend move. There is much more to Elliott Wave of course than this simple pattern. If you aren’t that familiar with Elliott Wave, you’ve no doubt heard of it over and over again in technical analysis discussions. Well, you’re in luck because right now, there is a limited time offer for a 47 page eBook which not only explains the basic theory behind Elliott waves but also goes a little deeper into how to use them to find and trade opportunities in different markets. Download the free eBook and do it now because the offer is only on for a few more days. Getting back to the Nasdaq breadth, we see a very similar pattern end the bear market in late 2008 as it did in 2002. First, there was a very strong up move (A) and then a shallow retracement (B) and then a continuation move (C) in the original direction. Not only is the ABC pattern almost identical, it takes place almost during the same time of the year! Babak, Can you place the Nasdaq Index next to the advance/decline so we can get a better sense? Thanks. 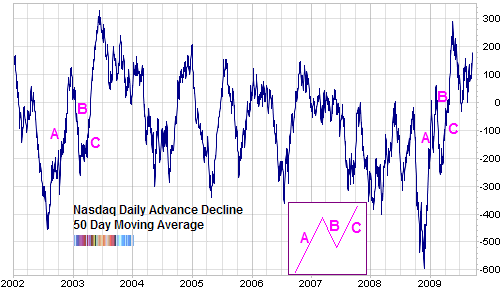 If you’re applying an A-B-C pattern to the latest advance then where is the impulse wave it is correcting? Also, try looking at it in log scale since this chart covers such a long period. I’m not sure EWP applies here as much as I have a tendency to look for it everywhere too. Babak, my emails to you are being returned with mailbox full message. We are likely to close today with our third ten day 2/1 advance/decline thrust of the year. Unprecedented. I will have more later. I’m receiving all my emails (as far as I can tell) but there seems to be a problem with the email server and am trying to get it fixed asap. I, too, have been trying to send you an email for over a week & getting the “mailbox full” message. Dave, again to avoid the permabear tag, tape analysis is a small part of what I study. I expect that I will be short the sps some during the post expiration week, especially if the expiration week gets overdone, but I think the intermediate direction could continue to surprise to the upside. It looks like your detailed post is waiting moderation so my post might be posted before yours. “…again to avoid the permabear tag…” I assume that you mean “permabull”. Dave, Wayne’s guest post is up (see link above). Yes, I think he meant to write ‘permabull’ instead of permabear. ps I’m working on the email error but as mentioned, I’m receiving all email (in spite of the error message which says the inbox is full). So if you write me, I’ve gotten it but haven’t had a chance to respond yet. Hope “short the sps some during the post expiration week” works better for you than on the 9th when you wrote “and unfortunately short the sps today” trading against your own powerful bullish data. yes, I meant permabull. I sense that you took offense to my defense of not being one. None was intended and I have always appreciated your post which I consider to be of the intelligent sort. In an attempt to not come across as one who sees himself as the sole owner of all market knowledge I was humble enough to point out on the 9th that I was losing money that day on a short side day trade. Thanks for reminding everyone. In my day trading account, I am often long Monday, Wednesdays and Fridays and short Tuesdays and Thursday, and the next week vice versa, and am accustomed to taking lots of small losses and consider them the nature of that particular beast. My intermediate outlook is used to give me a modest lean in my day trading and to manage my retirement account, and nothing else but makes for much more interesting public discussions topics than day trading anomalies. In appreciation for the interesting blogs that Babak post for free in this forum, I was motivated to reciprocate when I occasionally came across something that I felt the majority of intelligent readers would appreciate. Once I feel that is not the case, I have plenty of other pursuits to occupy my time. These blogs discussions can degenerate quickly if we don’t all attempt to concentrate on providing fact based comments. Three weeks ago, I was called crazy in here for suggesting that the market was a buy when no stocks were making new 12 month lows and I am possibly oversensitive. But, I really don’t have an incentive at this point in my career for participating in such dialogue. 1) i wasn’t accusing you of being a permabull. I was merely trying to establish a reference point. The fact that you’re not makes your info more creditable. 2) I wasn’t being defensive. 3) Your various data contributions are totally inline with my “ABILITY to get OB/OS” comments. You & i are on exactly the same page on the thrust of your info. 4) I wasn’t trying to “remind(ing) everyone”. The easy money has been WITH your data not against it. 5) As a former pit trader of 5 yrs, i’m used to making plenty of mistakes. It comes with the territory. 6) chill out. We’re on the same page…going higher in the IT. As an aside to anyone, when a move goes against seasonality; go with the move. Dave, I can appreciate the concept of your seasonal comment but do you put any credence in the Reverse September Barometer? I have that study somewhere and there seems to be some statistical correlation. I’m thinking a pullback next week could be healthy for the Bulls, especially if they take a shot this week at the 1080-1100 level.